Some of you might have a packet sitting in the fridge right now. Don’t you? Well, what is your plan? 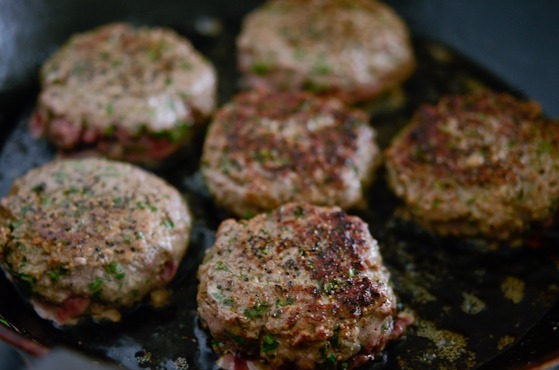 If you don’t have anything in mind, try this Parsley Peppercorn Beef Patties. This French inspired poor man’s gourmet dinner might be your next best thing for the ground beef. All you need is ground beef, fresh parsley, garlic, freshly cracked pepper, and a little chicken stock and cream. And of course, a little bit of butter will make everything tastes good. 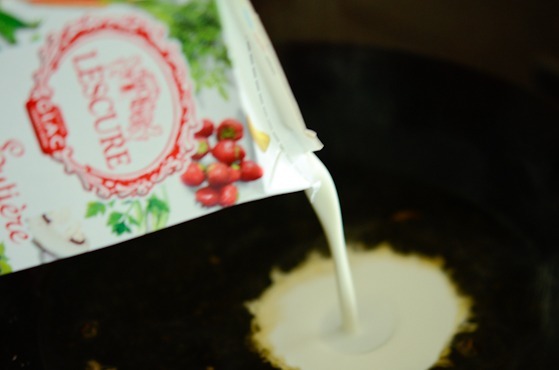 The ingredients are something that most of us might already have in our fridge or pantry. If my memory is correct, I found this recipe in one of those housekeeping magazine at a dentist office many years ago. I had never understood people who rips the magazine pages provided at the doctor’s office until the moment I saw this recipe on the page. I had an urge to tear the page off. But I couldn’t. Instead, I memorized the recipes. I came home and made it fresh out of my memory and boy! Was it delicious or what? This might not be the exact same recipe as written on the page but should be close enough. I’ve made it many times and adjusted in a way that works for me. I hope it works for you, too. And the real beauty of this recipe? Getting your creamy French dinner ready in about 20 minutes without breaking your bank account. 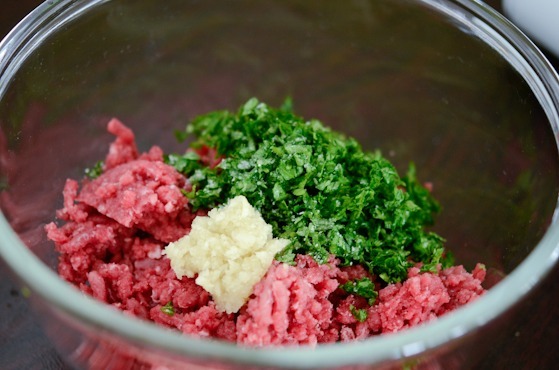 In a mixing bowl combine ground beef (as lean as possible), chopped fresh parsley and minced garlic together. Season with kosher salt and mix with a spoon. Form into thick patties, any size you like. 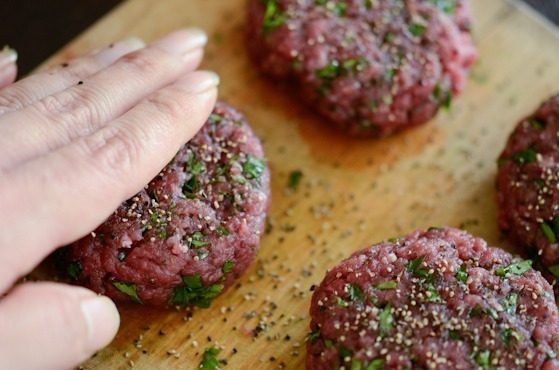 Sprinkle lots of freshly cracked black peppercorn on both sides and pat gently with your fingers to help adhere to the patties. 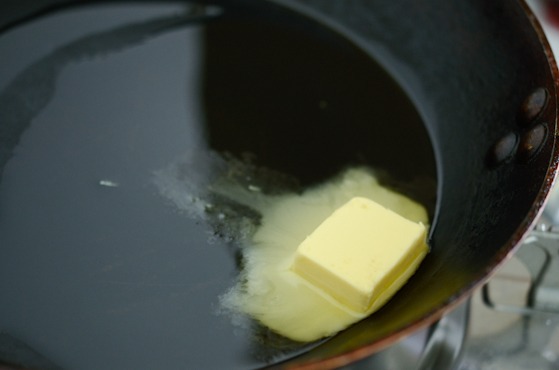 Melt a tablespoon of butter on a skillet. Brown your patties over medium heat. No need to cook all the way. 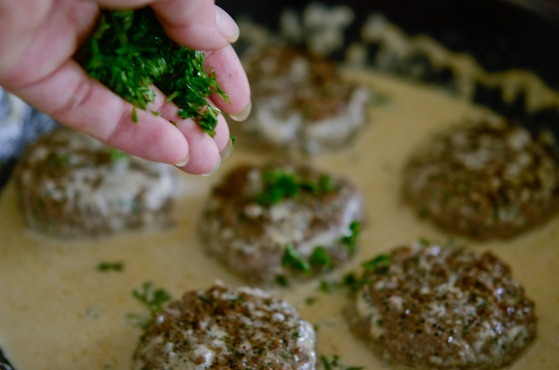 Transfer the patties to a plate and set aside. 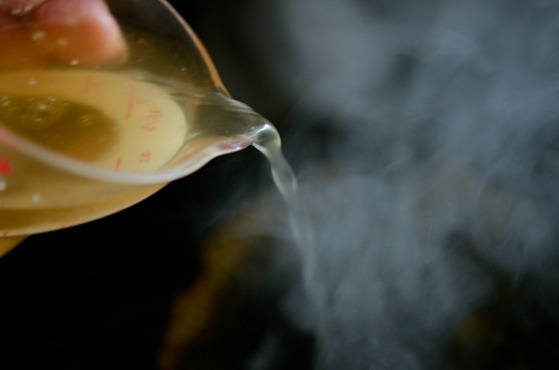 Drizzle chicken stock or beef stock to deglaze the pan. Add the cream and stir with the stock. Return patties to the pan and simmer for 5 minutes. Season the sauce with salt. 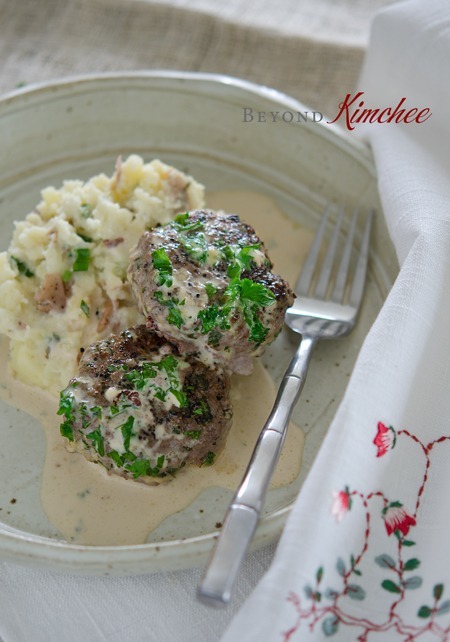 Sprinkle more parsley on top and serve warm over mashed potatoes. “Savoureux!” and “délicieux!” Blow a sweet kiss to the chef as a token of appreciation. This petite Coryenne Madame’s craving of creamy food has been well satisfied with this meal. In fact too satisfied that she wanted to have a piece of Kimchi in her mouth at the end. Isn’t she weird? 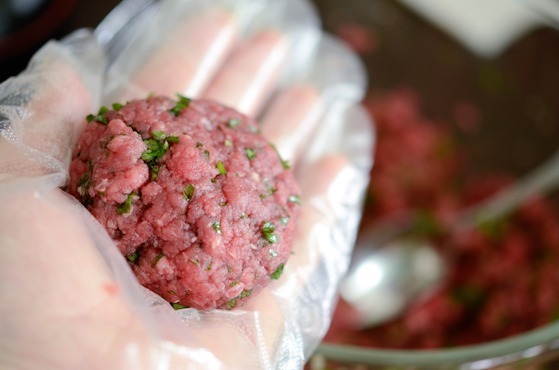 In a bowl combine beef, garlic, parsley, salt and form into thick (about 1") patties. Sprinkle peppers on both surface of patties and press gently to adhere. Let the patties sit for 15 minutes. Heat 1 tablespoon butter on a skillet over medium heat. Sear patties until golden brown both sides. Add more butter if needed. Remove from the skillet and set aside. Pour chicken(or beef) stock to the skillet and degalze the skillet. Add the cream and combine. 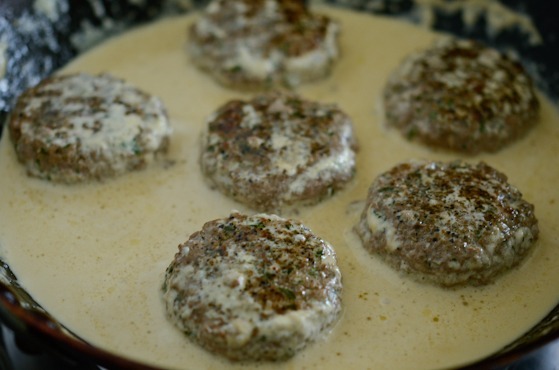 Add the beef patties back into the skillet and simmer for few more minutes over low heat until the patties are evenly cooked and the sauce is reduced a little, about 3-5 minutes. Season the sauce with salt if needed. 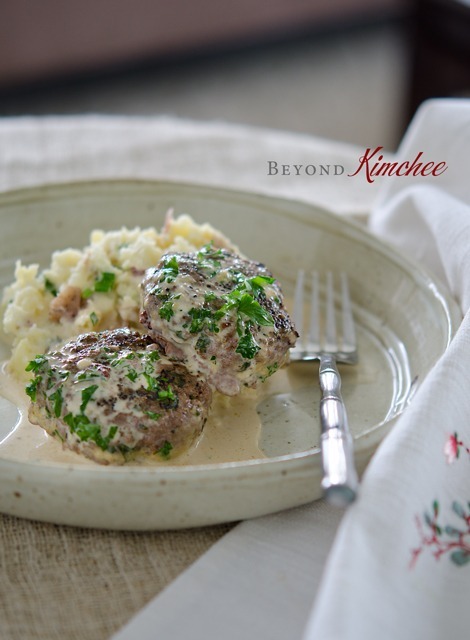 Sprinkle more parsley and serve warm over mashed potatoes. I definitely vote for using both butter and cream! Great philosophy. ;-) And this is such a nice looking dish. Love all the black pepper in it! A nice way to make something special out of ordinary ground beef. Thanks for this. I used to make a similar recipe when I was living in my dorm, although it definitely wasn't as elegant as yours! I love the peppercorns mixed into this one, definitely adding some bite! Great recipe! Sounds delicious and easy enough. 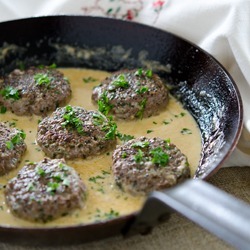 I have a packet of frozen beef mince in the freezer, will go get some parsley and cream to make these, thanks ! That looks like just the thing you want when you're hungry! So hearty and comforting. This looks absolutely amazing...what a great recipe and pictures making my mouth water. 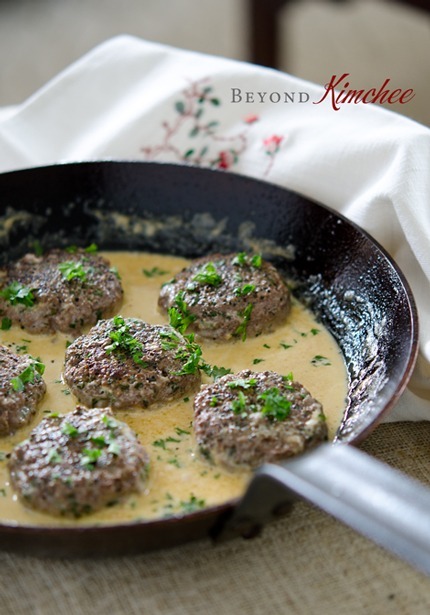 I love ground beef and I think I will be making this very soon! Thank you for sharing!